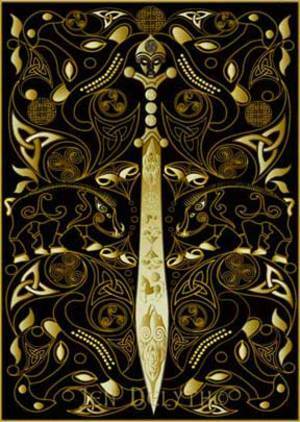 Warrior - Freagarthach the Answerer is the Sword made for Lugh of the Many Skills by the makers Goibhnui, Creidhne and Luchta. A finely crafted magic sword containing all the sorcerors' symbols of the warrior. Forged in the heat of a lightning bolt, and imbued with the ferocity of the Boar, the deadly knowledge of the Raven Morrigan, and the golden strength of the Sun Horse. Freagarthach the Answerer was fearless, invincible, and sought the blood of the enemies of any whose grip was strong enough to keep the sword from leaping into the fray with a battle lust all of its own. Forged in light and the strength and fertility of the sun, the protective power of the bull, the boar and the horse, the sharp sword cuts through the tangled energies of psychic disturbances, held with clear intentions, of the honorable warrior who wields it. This sword form is loosley based on a Celtic Bronze Age Tesson sword with anthropomorphic hilt 1st Century BC. Century BC.